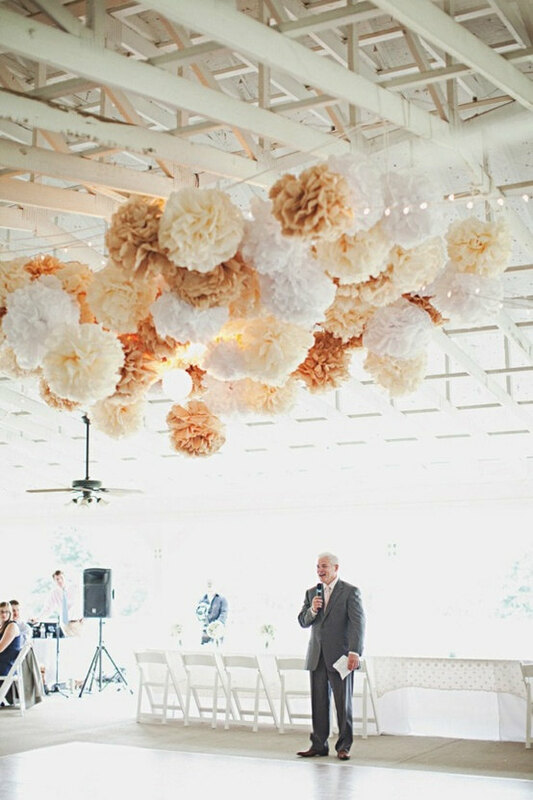 Tissue paper flowers are an easy craft that provides massive visual impact, especially as an art installation. Anyone can make these flowers from bridal parties to small children. It’s a fun way to get people involved in your decorating. The flowers are pretty and delicate but last longer than real flowers. While we’re a sucker for gorgeous blooms and hanging flowers, we also love the creativity of DIY paper wedding flowers! You can actually mix and match real flowers with paper flowers at your wedding for an eclectic look. Tissue paper flowers might be an easy and inexpensive way to add volume and color to your decor while still using real flowers for bouquets and other important areas. Tissue paper flowers are easy to customize by color and size, making them a versatile option for weddings and parties. They are a great way to decorate for all those pre-wedding events like bridal showers and rehearsal dinners. Below we’re sharing some of our favorite tissue paper wedding flower resources in case you’d like to join in on the crafty fun. You might find yourself making tissue paper flowers for yourself even though your not planning a wedding! Making tissue paper flowers is very easy. You’ll need floral wire or string, scissors and lots of tissue paper. That’s about it! Stack 5-8 sheets of tissue paper on top of each other and smooth out. Fold paper accordion-style. Crease with each fold. 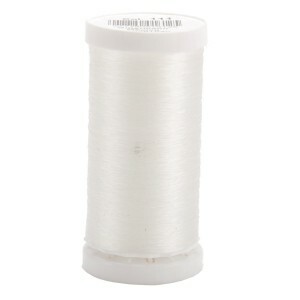 Gather the folded tissue paper and fold wire or string around the center tightly. Cut the edges and round them off to create a scallop effect. Separate and fluff each layer of tissue paper. Pull to the center of one side only and leave a small space in the middle of each flower. Group your flowers together in an arrangement! You can also add leaves, string them to hang, or put them on a wall to create a cool backdrop. They make great visual art backdrops or lovely centerpieces. We’ve previously also published a tutorial for hanging tissue paper flowers complete with step by step visual instructions for hanging tissue paper flowers. 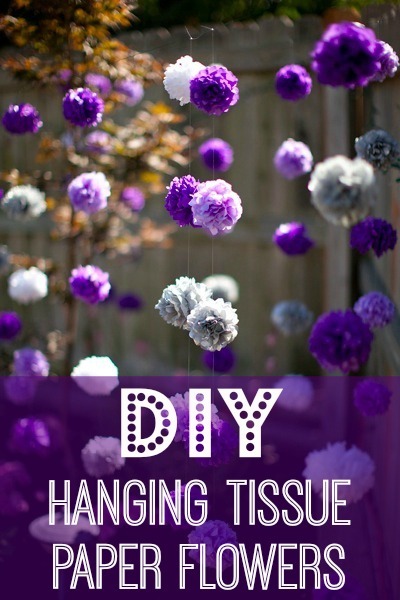 You can find that tutorial here: DIY Hanging Tissue Paper Flowers Tutorial or watch the video below to see how to use the tissue paper flowers to create a hanging style! You can also use these flowers in a bouquet. The following video shows you how to create these tissue paper flowers with stems so you can make a bouquet. Whether you plan to use these paper flowers as a bouquet or a hanging decoration you’ll be thrilled with how versatile they are. As we mentioned, you don’t need many supplies o make your own tissue paper flowers for your wedding or home, but you will need a few things. Supplies needed for tissue paper flowers can readily be found at your local craft or dollar store. 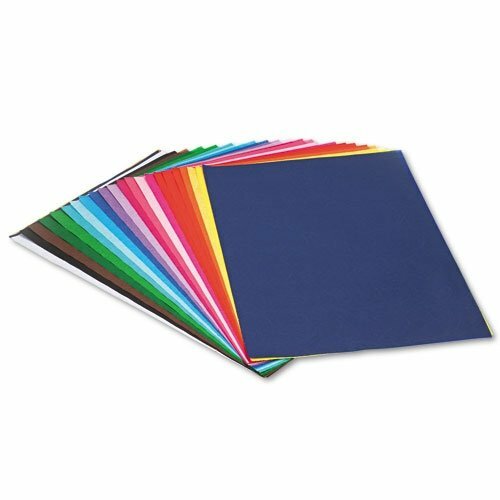 You can also purchase supplies online from sites like Amazon to be sure you get the colors of tissue paper you desire. That’s it! Hopefully you already have most of the supplies and if not you can get them all for around $10. Not bad for a pretty craft project! You can get fancy with additional elements like adding glitter or fragrances. But the basics of making tissue paper flowers? Few supplies and just some handiwork! 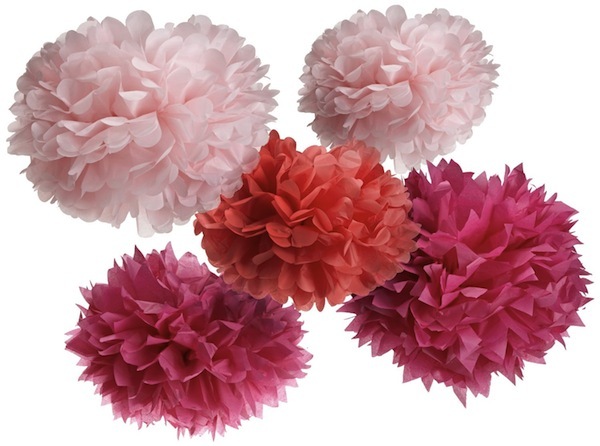 Martha Stewart Crafts Pom Poms! The great crafters at the Martha Stewart team have created tissue paper pom pom packages that make the process super easy for you. 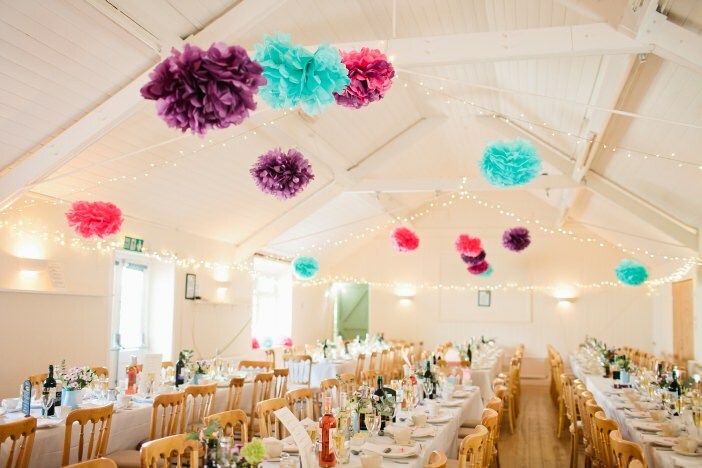 All you have to do to have beautiful tissue paper flowers or pom poms is fluff them up! They have a variety of sizes, shapes, and colors available on Amazon. 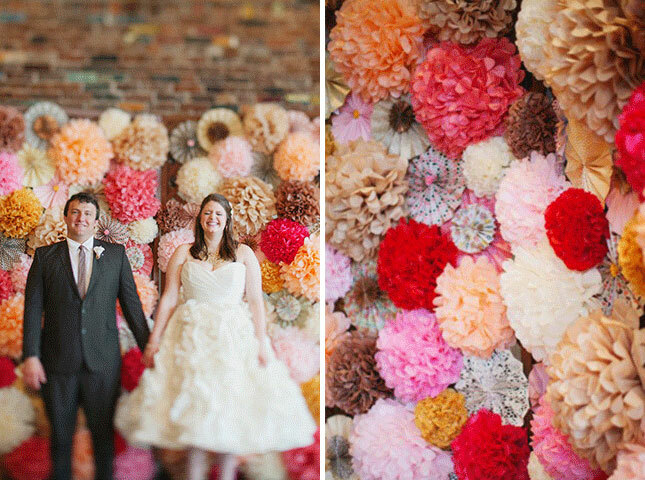 If you’re curious how other people have used tissue paper flowers at their wedding, here are a few examples. The best part about creating tissue paper flowers for a wedding or event is that you can use the tissue paper flowers afterwards to decorate your home! So pretty!